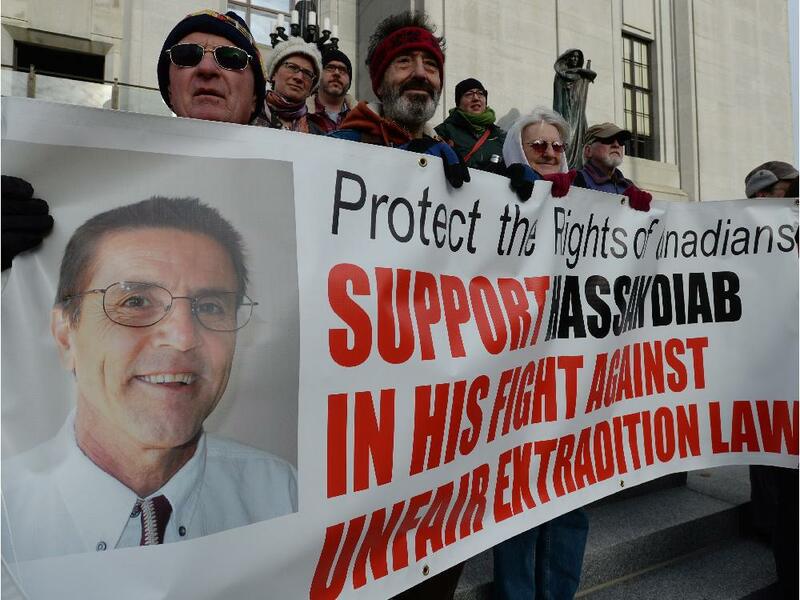 Hassan Diab Needs Your Help! French Prosecutors concede that there is credible evidence pointing to Hassan Diab’s Innocence, However, because of the political climate in France, they still want to proceed with a trial based on anonymous intelligence that French authorities received from a foreign service. This is despite the fact that the anonymous intelligence was discredited and withdrawn from the extradition hearing in Canada because of its extremely problematic nature. Canadian government officials have been merely raising concerns about the delays in Hassan’s case. Neither Prime Minister Trudeau nor any other government official has asked for Hassan’s release or even objected to putting Hassan on trial based on anonymous intelligence. This is despite the fact that such a trial would be contrary to fundamental justice, contrary to our Charter, and a recipe for wrongful conviction. Such a trial would not be allowed to happen to a Canadian citizen in Canada, much less when, according to the evidence gathered by the investigating judge, Hassan was not in France at the time of the 1980 crime. Please, we urge you to call or write to PM Justin Trudeau urging him to speak out against putting Hassan Diab on trial based on discredited unsourced intelligence, and asking him to use the full force of his office to bring Hassan home. As you know, the Canadian government extradited Hassan to France in 2014, even though the evidence against him was known to be “suspect”, “illogical”, “convoluted”, and “very problematic” (in the words of the extradition judge). The Canadian government has a moral obligation to help Hassan and bring him home now. On Wednesday or Thursday December 20 or 21, please call Prime Minister Trudeau’s office at 1-613-992-4211, or Fax him at 1-613-941-6900. You may also call his constituency office (Papineau, Quebec) at 1-514-277-6020. When you call, please be courteous, say good morning (or good afternoon, etc.) and give your name and where you are calling from. It is likely you will be talking to an answering machine. 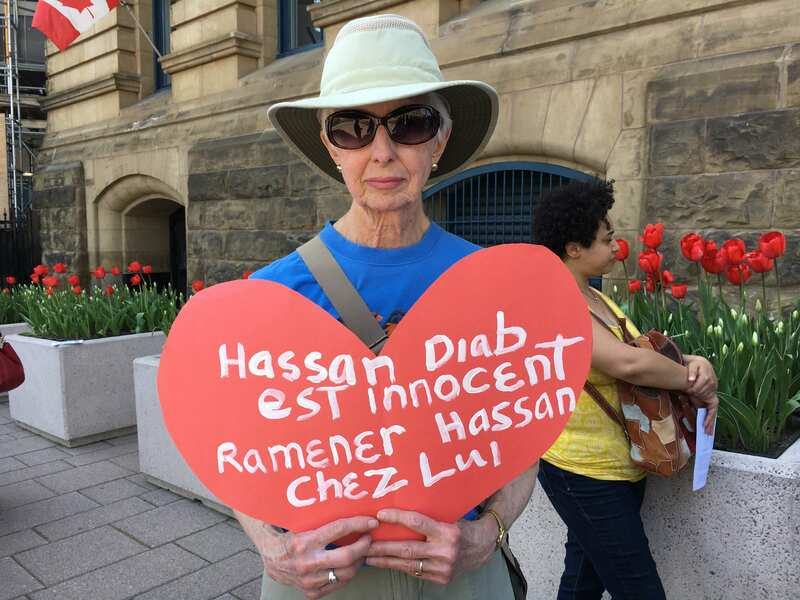 “Prime Minister Trudeau, I am calling to strongly urge you to speak out against putting Dr. Hassan Diab on trial in France based on secret and unsourced intelligence. I urge you to use the full force of your office to secure Hassan’s release and bring him back to his home in Canada. As you know, the French investigative judges found “consistent evidence” that Hassan was not in France in 1980 when the hateful attack occurred. French prosecutors are conceding that there is credible evidence pointing to Dr. Diab’s innocence, yet they are asking for Hassan to be tried based on secret, unsourced intelligence that French authorities received from a foreign service. This same intelligence was discredited and withdrawn from the extradition hearing in Canada because of its extremely problematic nature. The Government of Canada cannot condone a trial based on secret, unsourced intelligence, and must object to subjecting a Canadian citizen to such an unjust trial. PLEASE, DO NOT HESITATE TO PHONE EVERY DAY IF YOU FEEL SO INCLINED! Also, please share this call for help with your friends and family. French Prosecutor Concedes Credible Evidence Points to Diab’s Innocence, but Asks for Trial; Relies on Unsourced Intelligence Despite Noting Flaws. Numerous High-Profile Canadians Urge Prime Minister Justin Trudeau to Bring Diab Home. 14 December 2017, Ottawa – The French investigating judge has reissued a notice about the closing of the investigation in Dr. Hassan Diab’s case. He is expected to render a decision in the next few weeks about whether to order the discharge of Dr. Diab or refer his case to trial. In written submissions to the investigating judge, the French prosecutor concedes that there is a credible body of evidence that points to Dr. Diab’s innocence and casts doubts on the allegations against him. Despite acknowledging its flaws, the prosecutor asks the investigating judge to put Dr. Diab on trial because of the secret, unsourced intelligence that French authorities received from a foreign service. Don Bayne, Dr. Diab’s lawyer in Canada, pointed out that “the French prosecutor, while conceding that there is evidence that ‘casts doubt’ – i.e., proves innocence, such as the fact that numerous witnesses and documents prove that Dr. Diab was in Lebanon writing his university exams just as he has stated from the outset of this case; that the fingerprints and palm print of the suspect do not match Dr. Diab’s; and that the description of the suspect as a man aged 40-45 years clearly excludes Dr. Diab who was 26 years old at the time – nevertheless argues that they will rely on intelligence (secret, unsourced material from a foreign agency that has no proven reliability and amounts to nothing more than a bald allegation). Such a trial cannot be allowed to happen to a Canadian citizen, much less one who, according to the evidence gathered by the investigating judges, was not even in France at the time of the crime. A trial based on secret, unsourced non-evidence that cannot be challenged is contrary to fundamental justice, contrary to our Charter, and a recipe for wrongful conviction. The Government of Canada cannot condone a trial for Dr. Diab proceeding in such circumstances, and must object to a Canadian citizen being subjected to such a clearly unjust ‘trial’”. 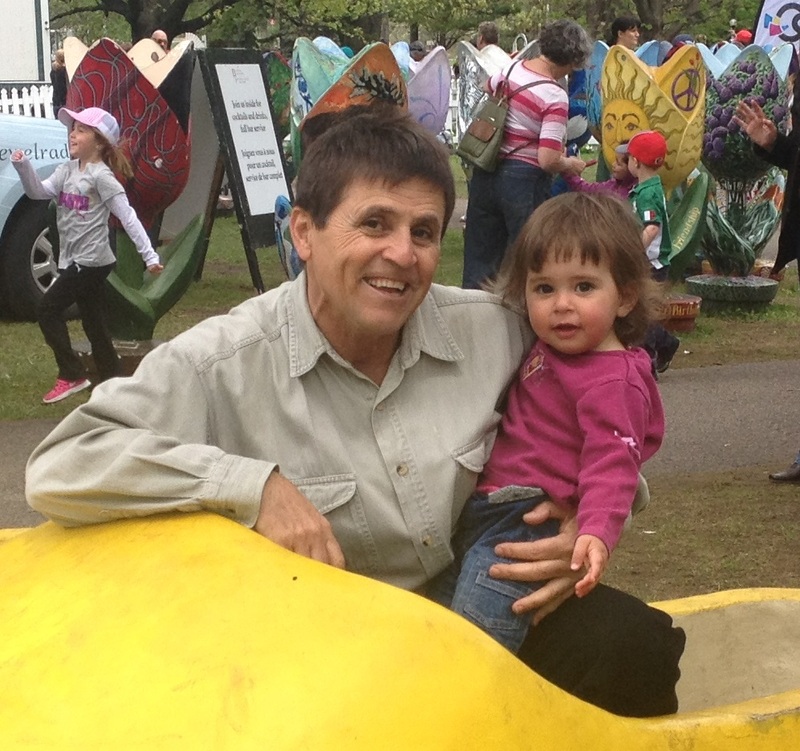 In early December 2017, the Hassan Diab Support Committee sent an Open Letter to Prime Minister Justin Trudeau urging him to use the full force of his office to help Dr. Diab and bring him home. The Open Letter was signed by numerous high profile Canadians including lawyer and former politician Bob Rae; Members of Parliament Don Davies, Elizabeth May, and Kennedy Stewart; Senator Kim Pate; politician and broadcaster Stephen Lewis; politician and former Chair of the Broadbent Institute Ed Broadbent; filmmakers Atom Egoyan, Avi Lewis, and Sarah Polley; actress Geneviève Rochette; philosopher Charles Taylor; authors Gabriella Goliger, Benjamin Hertwig, Naomi Klein, Kyo Maclear, Yann Martel, Monia Mazigh, Heather Menzies, Yakov Rabkin, and Nino Ricci; Bernie Farber, human rights advocate and former Chief Executive Officer of the Canadian Jewish Congress; Bob Goodfellow, former Executive Director, Amnesty International (Canada); Robyn Benson, National President of Public Service Alliance of Canada (PSAC); Larry Brown, President, National Union of Public and General Employees (NUPGE); Mark Hancock, National President, Canadian Union of Public Employees (CUPE); Ken Neumann, National Director for Canada, United Steelworkers (USW); Mike Palecek, President, Canadian Union of Postal Workers (CUPW-STTP); David Robinson, Executive Director, Canadian Association of University Teachers (CAUT); Larry Rousseau, Executive Vice President, Canadian Labour Congress (CLC); and many others. Dr. Diab is a Canadian citizen and sociology professor who lived in Ottawa. He was extradited from Canada to France in November 2014 in relation to a 1980 bombing outside a Paris synagogue that tragically killed four and injured dozens. The Canadian extradition judge found the evidence presented by French authorities to be “very problematic”, “illogical”, and “suspect”; yet he stated that he felt compelled under Canada’s extradition law to order Dr. Diab’s extradition. The French investigating judges in charge of the case found that there is “consistent evidence” that Dr. Diab was not in France at the time of the 1980 bombing. Official documents as well as several witnesses confirmed that Dr. Diab was studying and taking his university exams in Lebanon at that time. Four French judges have ordered Dr. Diab’s conditional release eight times in the last 18 months. However, each time the Paris prosecutor appealed, and the French Court of Appeal overturned the release order because of the climate in France. Dr. Diab has been in detention in France for over three years despite overwhelming evidence of his innocence, and despite the eight release orders by investigating judges. Dr. Diab’s lawyers in France noted that “This is an absolutely exceptional situation… The Paris prosecutor’s obstinacy in this case is not judicial but rather political”. On Wednesday November 29, please call Prime Minister Trudeau’s office at 1-613-992-4211, or Fax him at 1-613–941-6900. You may also call his constituency office (Papineau, Quebec) at 1-514-277-6020. In a deeply disappointing and stunning move, the French Court of Appeal quashed – for the eighth time – a release order for Dr. Hassan Diab. Hassan has been in pre-trial detention for three years, despite overwhelming evidence of his innocence. The French investigative judges in charge of the case found that there is “consistent evidence” that Hassan was not in France at the time of the 1980 Paris bombing outside a Paris synagogue that tragically killed four and injured dozens. Official documents as well as several witnesses confirmed that Dr. Diab was studying and taking his university exams in Lebanon at that time. Four French judges have repeatedly ordered his conditional release. However, each time the Paris prosecutor filed an appeal, and the French Court of Appeal overturned the release decision because of the climate in France. Hassan’s lawyers in France, William Bourdon, Apolline Cagnat, and Amélie Lefebvre, remarked that “this is an absolutely exceptional situation: Four judges have decided eight times that Dr. Diab should be released. The Paris prosecutor’s obstinacy in this case is not judicial but rather political”. Numerous high-profile Canadians have signed an Open Letter urging Prime Minister Justin Trudeau to use the full force of his office to bring Hassan home. These individuals include lawyer and former politician Bob Rae; Members of Parliament Don Davies, Elizabeth May, and Kennedy Stewart; politician and broadcaster Stephen Lewis; filmmakers Atom Egoyan, Avi Lewis, and Sarah Polley; authors Naomi Klein, Yann Martel, Monia Mazigh, and Nino Ricci. 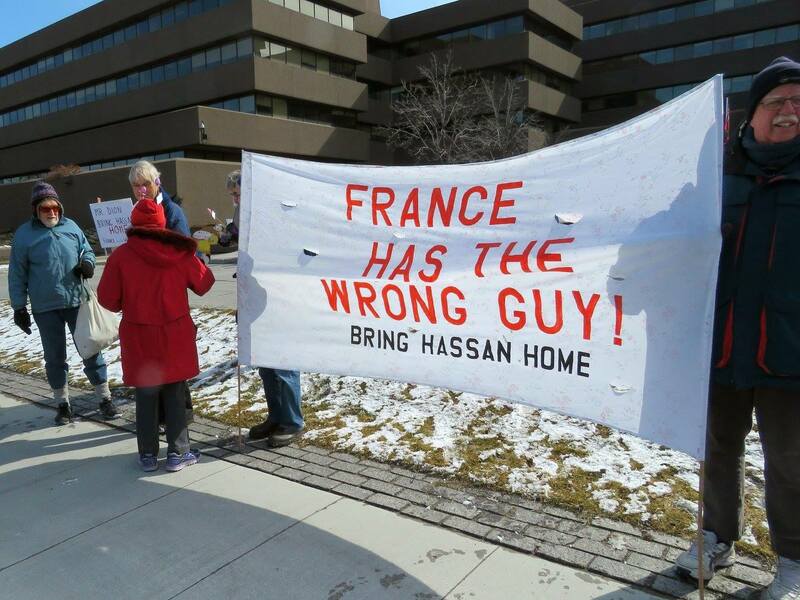 Hassan was extradited from Canada to France in November 2014, even though the Canadian extradition judge found the evidence presented by French authorities to be “very problematic”, “illogical”, and “suspect”. The judge stated that he felt compelled under Canada’s extradition law to order Dr. Diab’s extradition. Recently, Dr. Diab was informed that officials of a foreign state met with the French investigative judges in late September offering their help in getting him charged instead of freed and returned to Canada. This latest development increased serious and legitimate fears that political pressure might interfere with the investigations and jeopardize Dr. Diab’s right to fair and independent justice. On November 6, a fourth French judge ordered the release of Canadian Professor Dr. Hassan Diab on bail from a Paris prison where he has been behind bars for three years. This marks the eighth release order of Dr. Diab by four different French judges; but, as on seven prior occasions, the Paris prosecutor immediately filed an appeal. Dr. Diab is set to be released on bail on November 14, unless the French Court of Appeal overturns the release decision. Dr. Diab’s lawyers in France, William Bourdon, Apolline Cagnat, and Amélie Lefebvre, remarked that “this is an absolutely exceptional situation: Four judges have decided eight times that Dr. Diab should be released. The Paris prosecutor’s obstinacy in this case is not judicial but rather political”. Dr. Diab was extradited from Canada to France in November 2014, even though the Canadian extradition judge found the evidence presented by French authorities to be “very problematic”, “illogical”, and “suspect”. The judge stated that he felt compelled under Canada’s extradition law to order Dr. Diab’s extradition. Dr. Diab has been in pre-trial detention in France for three years. The investigative judges in charge of the case found that there is “consistent evidence” that Dr. Diab was not in France at the time of the 1980 Paris bombing outside a Paris synagogue that tragically killed four and injured dozens. Official documents as well as several witnesses confirmed that Dr. Diab was studying and taking his university exams in Lebanon at that time. Four French judges have repeatedly ordered his conditional release. However, the French Court of Appeal quashed all release orders following the prosecutor’s appeals, notably because of the climate in France. On July 28, 2017, the French investigative judges issued a notice about the end of investigations in Dr. Diab’s case. However, their final decision regarding whether to release Dr. Diab or refer him to trial was delayed because the French prosecutor failed to submit arguments within one month, as stipulated in the French Criminal Procedure Code. To this day, no such submission has been filed.